Last month, in a public speech, the regime’s supreme leader Ali Khamenei said that his regime provides assistance to the Hezbollah in Lebanon. Is there any other signal more obvious than these remarks as to who the principal source of terrorism and fundamentalism is? The Iranian regime presents its fundamentalism and terrorism under the cloak of religion. Therefore, in order to confront it, there is a need for a tolerant and democratic Islam. And the People’s Mojahedin represent this democratic alternative, which is the antithesis to fundamentalism. They represent an Islam, whose message is mercy, freedom, equality, fraternity, love and coexistence among all religions. Allow me to continue in Farsi. On the fifth day of Nowrouz and the start of spring, I again congratulate all of you, my compatriots inside and outside Iran on the occasion of the New Year. With the warmest greetings and congratulations, I wish the brave women and men, who are struggling to overthrow the ruling religious theocracy and the blossoming of the spring of freedom and democracy in Iran, victory. I hope that the New Year would be a year when the people on the whole of the region would be rid of the religious fascism ruling Iran. I feel privileged to be meeting you, our dear friends from the United States and different European countries who have come here on this day. The conference is being held on eve of the anniversary of deadly raid by Iraqi forces on the defenseless residents of Camp Ashraf on April 8. It was a crime against humanity based on the planning and orders of the regime’s supreme leader and in coordination with the terrorist Qods Force and designed to eliminate all the residents of Ashraf. On that day, the attackers in their armored vehicles drove over at least 22 residents of Ashraf and murdered 36 of them. But the Ashrafis defeated Khamenei’s plan to destroy its main opposition. The April 8, 2011 attack was in reality the most important response Khamenei gave to the Iranian people’s uprisings, which had two months earlier had shaken the regime to its foundation. As such, the attack demonstrated the Iranian regime’s urgent need to destroy the resistance movement. At the same time, it showed that the Iraqi government was doing the bidding of Tehran and the US government’s irresponsible policy towards the residents of Ashraf since it was a violation of the US commitment to each resident. It short, the US adopted a policy that pleased the mullahs in Tehran. It is common knowledge that a few hours before the killings on April 8th, a US military unit at Ashraf suddenly left the Camp. The question that still remains since then is who issued the order for the US withdrawal? Where is the commander of that unit who could testify about the truth? Indeed, why was there no investigation about this massacre as demanded by the UN High Commissioner for Human Rights? And why were US Congressional delegations and European Parliamentarians, who were seeking to visit Ashraf and called for investigations into this raid, not allowed to visit? In reality, the attack on Ashraf in essence is reflective of a major crisis, namely the Iranian problem. The ruling theocracy has reached a dead end. On the one hand, inside the country, the regime is faced with a major schism at the highest echelons of ruling clique, the prospect of eruption of uprisings in Iranian cities loom and coupled with deep economic bankruptcy. And on the other hand, outside Iran, the trend toward the fall of the Syrian dictatorship has made the mullahs irreparably vulnerable. To escape this mortal reality, the mullahs have resorted to ever greater terrorism and warmongering. The unprecedented rise in executions, 670 in the past year, accelerating the efforts to obtain nuclear weapons and directly taking part in the killing of the people of Syria are part and parcel of this policy. But at its very core of this policy is the effort to eliminate the organized resistance movement and to attack Ashraf, which hold the key to change in Iran. Indeed, the mullahs, in order to escape their inevitable overthrow, have resorted to war against the people of Iran, the region and the international community. To confront this evil warmongering which threatens regional and global security a decisive policy is in order. The West’s policies to deal with this regime, however, have all failed. We see that in the face of the regime’s nuclear danger, the US government is on the one hand exaggerating the impact of international sanctions and on the other is promoting the baseless assessment that as though the mullahs have not yet made a decision t to build a nuclear bomb. When a heavily armed forces has begun marching forward from a distance, who would benefit from saying that there is no movement forward? Similarly, western governments have taken a passive attitude towards the Syrian regime’s crimes against humanity. Nevertheless, the mullahs, with the help of the Iraqi government, are repeatedly sending arms shipments to Bashar Assad’s regime. And finally, the policies of the United States and the European Union is submitting to the mullahs’ covetous designs on Ashraf and the unjustified continuation of the Mojahedin’s terrorist designation have benefited the Iranian regime. But, kowtowing to the religious fascism ruling Iran is the flip side of the bankruptcy of the policy of appeasement. The other side is harsh and venomous attacks on those who advocate change in Iran. Today, everyone can see that a powerful tendency among senior politicians, officials and military commander in different US administrations in the past 20 years has taken shape and views the establishment of democracy in Iran as the effective solution to the Iranian problem. Since years ago, the same tendency has enjoyed enormous credibility and important stature in the US House of Representatives and Senate. Majorities in 30 national parliaments in Europe have also voiced support for these objectives in recent years. Clearly then, the recent attacks by a few anonymous US officials against this dignitaries who promote democracy in Iran, is in truth prompted by the bankruptcy of the policy of appeasement and conciliation. These attacks are of course unjust and unfair and quite unethical and immoral. But beyond that, when you open the curtains, you recognize that these policies are in a showdown against one other. On the one side there is a policy which wants that the mullahs’ regime in power. As a result, in the face of the threats posed by religious fascism and its terrorism and efforts to get the bomb, the proponents of this policy attempt to hide their utter weakness through empty posturing and words. The proponents of this policy are so desperate that they might ultimately allow the ruling mullahs to obtain nuclear weapons. On the other side, there is a tendency which wants to see the mullahs overthrown. This front is comprised of renowned US personalities who have embarked on an honest and responsible campaign to change an outdated policy. For this reason, those shortsighted appeasers are attacking them. The Iranian people’s resistance is at the core of the showdown between these two policies. These personalities who truly embody defense of democracy have repeatedly criticized the US government for reneging on its commitments to protect the residents of Camp Ashraf. The question is: Do reneging on commitments, turning one’s back on ethical principles, ignoring international laws and adopting policies that serve the interests of the Iranian regime, benefit the real interests of the United States and the wider world, or the call for a change in those policies? The main sin these honorable personalities have committed is that they are demanding an end to the mullahs’ nuclear program, calling for their overthrow and preventing a nuclear Iran, which would threaten international peace and security. Their sin is that they have opposed following the Iranian regime’s plans and designs against Ashraf and its residents. Recall that in one of these conferences about the correct policy vis-à-vis Iran, Amb. John Bolton said unequivocally that Ashraf is part of the solution to the Iranian problem and not part of the problem itself. These personalities have also spoken out loud and clear about the realities in Camp Liberty. They have asked why humanitarian and human rights standards non-existent at Camp Liberty are. For this reason, anonymous US officials who are trying to cover up the situation at Camp Liberty are upset about remarks by these luminaries. 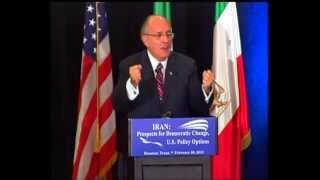 They complain why Mayor Giuliani has spoken against building prisons in Camp Liberty. Is stating an obvious fact really a crime? Or hiding it? Indeed, if the conditions of the Camp are acceptable, why did you not allow 21 of these luminaries, who said they were ready to visit Liberty, to actually go there? The bigger sin these luminaries have committed is that they have protested against injustice and the flouting of law concerning the Iranian Resistance, namely the designation of the PMOI. They have stated the obvious fact that the PMOI’s continued designation lacks legitimacy and is legally and ethically unjustified. Recall that Gen. Shelton went even beyond that and wrote the refusal to remove the PMOI’s designation was betraying democracy. 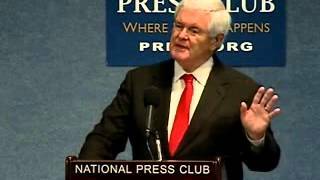 And let me quote from Secretary Ridge, who said that if we want to see a democratic Iran, regime change is our only hope. And the potential for achieving democracy in Iran lies with an opposition group which is committed to democratic change, namely the People’s Mojahedin which has been subjected to genocide for decades. In the mean time, the talking heads and the media controlled by the Iranian regime have joined the chorus to slander and insult these personalities. The regime’s notorious agents in the US fan the fuel of these attacks. Do the opinion leaders in the US not feel ashamed for joining the religious fascism ruling Iran? Nevertheless, the people and history will pass quick judgment that these personalities have offered the greatest service to global peace and security. So, let me repeat the call by Judge Mukasey to the US policy makers, when he said that time has come that our words and deeds are based on our principles and beliefs. So that when the succeeding generations ask us what we have done to advance good in the face of evil, they could find the answer so that we and they would be at peace with our conscience. And finally, this great question of America’s true conscience, posed by Rep. Kennedy, still resonates in our ears, “As good human beings on which side of history are we standing? Right or wrong?” And it was Mr. Kennedy who cried out that defending Ashraf is a test for mankind that is free, whether in the US, in France, in Germany or elsewhere. As you may be aware, to date, three groups of Ashraf residents have been transferred to the new camp. This transfer has regrettably been turned into forced relocation coupled with enormous harassment and pressure. Four days ago, following the arrival of the third group of Ashraf residents in Liberty, Engineer Bardia Amir-Mostowfian, died of a cardiac arrest due to fatigue and pressures inflicted by lengthy inspections and searches. Thus, we again say to his fellow Ashrafis and those in Liberty as well as to his honorable family, a number of whom are present here today, that Bardia is alive and present and his struggle and ideal, the freedom of the Iranian people, will certainly triumph. Hail to Bardia, who stood to the last breath for the freedom of his people and his nation. Contrary to the repeated emphasis by the UNHCR, the residents at Liberty have no freedom of movement. Similarly, they are denied visits by their families and lawyers. But most important problem is the unjustified presence of armed forces in the private sections of the Camp, and has become a major source of insecurity for the residents. Just two days ago, armed police suddenly and without any reason entered the residential quarters of the women in the camp, causing great anxiety and tension. This is an example of dangers which the unjustified and threatening presence of armed forces in the interior perimeter of the camp creates. Why has the UN not forced the Iraqi government to respect the privacy of camp residents? I declare here it would be totally unacceptable and intolerable for this situation to continue. I warn that that the presence of armed forces inside the camp contributes greatly to a humanitarian catastrophe. As regards the living conditions at the camp, I must also emphasize that contrary to all the promises, are substandard as it pertains to the area needed for the residents, to hygiene, facilities and services. It basically amounts to imposing a painful condition and exerting pressure on the residents. Let me summarize. Contrary to the UN and US commitments, what the Iraqi government has handed over that is called Liberty is a terrible and run-down facility, whose conditions are exacerbated with an assortment of restrictions as well as the presence of the police forces. Nevertheless, the Ashrafis will improve and renovate this uninhabitable site through their forbearance and efforts. The Police and armed forces leave Camp Liberty completely and that agreements in this respect are implemented. The residents have the right to transfer their moveable property to the new location and be able to sell the rest of their asset or send them to another location. Obstacles in the path of building the infrastructure are immediately removed so that the residents could with their own expense build the most urgent facilities such as a location for patients and creating pavements for those who have difficulty walking. The process of reconfirmation of the refugee status of the residents by the UNHCR and their resettlement in third countries is expedited. I ask the US government, the European Union, Secretary Clinton and Baroness Ashton to support the provision of the minimum assurances in the new camp. The United Nations is expected to uphold its real mission, which is to defend the oppressed and the victims and at least stay neutral between the residents of Ashraf and the Iraqi government. I want to also warn that the residents of Ashraf and Liberty have generously demonstrated utmost goodwill and flexibility. But you should beware of the Iraqi government’s wicked and evil intentions. Indeed, the crux of the matter the Iranian Resistance’s opposition to the Iranian regime, which has resorted to warmongering and suppression in order to preserve its fragile rule. 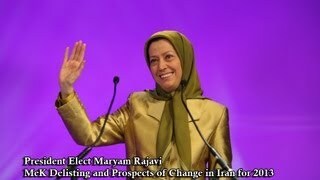 The residents of Ashraf and the Iranian Resistance are standing up to this regime will all their might. The mullahs ruling Iran must take their pipe dreams of destroying or forcing the PMOI into submission to their graves. Be it that with global solidarity, the New Year would be the year of the defeat of religious fascism.